Introduction. “Exercising is good for you, but sometimes you can injure yourself when you play sports or exercise. Accidents, poor training practices or improper gear, even poor nutrition, can cause them. Some people get hurt because they are not in shape. Not warming up or stretching enough can also lead to injuries. Best Essential Oils to use on aching muscles, strains, pain, or damaged ligaments: These oils are all available in a handy aromatherapy kit from Jeanne Rose, called, Sports Relief Kit. Blue Sage (Artemisia douglasiana) as a tonic, cleansing, astringent, fat-reducer; Use in cellulite-reducing massage with Juniper Berry. It is especially useful for all forms of exercise and sports injuries. Cypress (Cupressus sempervirens). Use with Bruise Juice and apply externally for aching muscles, strains or pain, inhale to warm and uplift; it is soothing and relaxing when inhaled. This oil can also be used with Lemon oil and Grapefruit peel as well for external massage for cellulite, aching joints and as a soothing astringent. Basil or Holy Basil (Ocimum basilicum). In a Bruise Juice base this oil is useful for the heart, nerves, sinews and tendons. It is analgesic and soothing to aching muscles. It is inhaled to stimulate the mind and intellect and is applied with Rosemary oil to aching muscles or to the scalp for conditioning and to improve hair-growth. Juniper Berry (Juniperus communis). Use in cellulite-reducing blend, to stimulate the mind, or as a rub for arthritis to reduce inflammation and relieve pain. This is a great oil when mixed with all the others mentioned for sports injuries. Lemon (Citrus limon) as a tonic, cleansing, astringent, fat-reducer; it is used in cellulite-reducing massage with Juniper Berry and Cypress or mixed with other oils on your muscles. If you mix the Lemon oil with oils from the Woman’s Kit such as Grapefruit peel oil, they are refreshing and when used as a scent people will think you are 5 years younger. Sage (Salvia officinalis) is especially good for deodorizing underarms and feet, always dilute to 1% in a carrier – oil or lotion. This is an analgesic (pain-relieving) essential oil; apply, rub in gently and then apply when needed for all exercise related problems. Works especially well along with Bruise Juice. All of these oils can be used together, they will be analgesic (pain-relieving) to ease the aches and pains of rigorous exercise; they can also be healing if there are any tears or inflammation in the muscles. Use them often and as often as needed. Sometimes for very painful injuries you may wish to add carrier oil to the essential oils. A 10% mixture of essential oils to 90% carrier will be therapeutic. The addition of Bruise Juice as a carrier oil to any of the oils will both improve and increase healing. These oils are conveniently contained in Jeanne Rose Sports Relief Kit and is available at the Jeanne Rose Online Store. Hydrosols are good sprayed on sports injuries where there is open skin. Any hydrosol that is fresh and clean can be sprayed on an injury to both clean it and to reduce pain. When you are bicycling or skiing and you fall, not only might strain muscles but you may also scrape the skin. A hydrosol such as Tea tree will clean the wound and if you are thirsty can also be diluted and drunk for an internal cleansing effect. In particular, for sports scrapes, thorns, small cuts; the best hydrosols are the ones that you have with you but in particular, Lavender, Tea Tree and Owyhee are good. Massage • Massage your body with a mixture of essential oils such as Sage and Basil; 10 drops each in 2-4 ounces of carrier oil for aching muscles. Other essential oils are valuable for Sports Relief and aching muscles (or arthritis), try Cypress, Juniper Berry, Blue Cypress and Lemon added to any of them for a superb massage oil formula. Two% is the recommended amount of essential oil to carrier oil. That is 2 drops essential oil to 98 drops carrier. 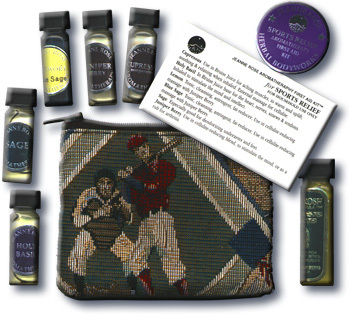 Make good use of your essential oils in Jeanne Rose Sports Relief Kit. These same oils are also excellent in the treatment of cellulite. For a cellulite treatment, massage in the named essential oils, wrap the area in saran wrap and then wrap in very warm towels for 20 minutes. Before your exercise, take 1-3 tablespoons of bee pollen for endurance. Afterwards, take a little Wheat germ oil in skim milk for energy. Use these two food supplements before and after all exercise and it will negate the need for a meal, that is, if you are trying to diet. Bee pollen is a good supplement food for healing aching muscles and joints and it makes up a healthy part of the diet of any sports-minded athlete. If your muscles ache, part of the ache is the buildup of lactic acid. You might also drink a tea of Saffron. Saffron helps to remove the buildup of lactic acid in the muscles. Any exercise is good exercise. Simply walking 20 minutes per day is enough to get blood moving to all your parts. This will stimulate your body, exercise your heart and improve your outlook. Winter exercise can include skiing and summer exercise, or water sports. Water skiing strengthens the legs and arms. Jogging in the sand, volleyball, and baseball are all fantastic summertime conditioning sports. Skiing, snowboarding and hiking are excellent in the winter. Learn how to swim or go swimming. I strongly recommend that you take swimming lessons, and enroll the children. You and your family can enjoy this sport for your entire life. If you breaststroke or backstroke, 400-500 calories are used every hour, while the crawl uses 400 calories every thirty minutes. Learn to swim, this will also be helpful if you like to boat or water ski. Swimming can save your life. Swimming is an excellent sport for the disabled. The water supports weight and conditions the body in a relatively short time. Swimming tones the shoulders, upper arms, chest, back, abdomen, and legs and thighs. It is an excellent sport particularly for sedentary persons who need to strengthen and tone their backs. Swimming is especially stimulating to the heart and lungs. Experience the pleasures and health of hydrotherapy; these water therapies include hot tubs, hot baths with Epsom salts, whirlpools, mineral waters, mud baths and hot and cold mineral water sprays. These water therapies can be used for all types of diseased states and if used regularly will aid the body to heal. Read the Bath Health article. Read Jeanne Rose Herbal Body Book for many baths and clean products for the skin. Any exercise should be undertaken for a minimum of forty-five minutes -- it takes the body thirty minutes simply to mobilize its fat reserves before actually using them for energy. In other words, if you swim or run for forty-five minutes, the first thirty minutes conditions the body and the last fifteen burns fat. Bruise Juice is an invention of Jeanne Rose and has been made regularly since 1969. • This is may be my most favorite and most powerful formulas for sunburn, scratches, insect bites or any type of scrapes. I have been making it with the seasons since 1969. I make Bruise Juice to the waxing and waning moon because it makes a better product. It takes 2 weeks to make. I make it as often as necessary and whenever I have orders. For skin care, for healthful body care you cannot beat Bruise Juice. Use it for everything, bruises, sunburn, aching joints, sore muscles, irritated skin, bug bites, bruised or broken ribs, whatever you can think of, Bruise Juice will help it. Use it often as necessary. It is used on horses and pets as well.. I add essential oils to the basic herbal formula. Some of these oils can be Plai – first aid in all its forms; Rosemary verbenone - anti-fungal (cineol) and for its physically and mentally stimulating scent; Spikenard – anti-fungal and mentally soothing; Canadian Hemlock – mild anti-bacterial and first aid treatment and/or Tea Tree, Manuka or Kanuka. Always at least 50 – 60 herbs, roots, leaves, flowers, barks and/or spices in the Bruise Juice To combat any sort of physical problem. at least several times per day.